For a Deaf Son is made possible in part by Acordia, a network of companies providing insurance brokerage, administration, and selected financial services across America; American Airlines, providing daily flights to Europe and offering the American Airlines Advantage travel awards program since 1981; the Southwestern Bell Foundation. Funding also is provided by the Corporation for Public Broadcasting and the Southern Educational Communications Association. (Describer) A little boy with curly blonde hair and glasses presses buttons on a toy shaped like a rock guitar. (Describer) Thomas, the boy, wears hearing aids and smiles. about was the music you would never hear. We didn't know a thing about what it really means to be deaf. Thomas! (Describer) Title: For a Deaf Son. The title is shown in sign language and a close-up of lips. (Describer) Thomas’ eyes are shown above the title. People wave different color flags over a banner saying “deaf president now”. Women chant in sign language. (Describer) Hundreds rally with the National Mall in the background. for the Deaf in Washington, DC, shut the school down. They were demanding that, for the first time ever, the board choose a deaf person to lead the university as president. When the students won, it was hailed as a great victory for deaf people everywhere. (Describer) In a yard, a woman holds a plant for another boy to water. The world can't stop us. (Describer) The woman and boy sit in bed with a man, talking. when all that was going on. And frankly, we had other things on our mind. Laurie and I were expecting our second child, and our son Matthew couldn't wait to meet what he hoped would be his new baby brother. (Describer) Laurie holds the baby. In September of 1988, Thomas Shy Tranchin was born. (Describer) He lies naked in a bathtub with Laurie washing him, the camera zooming in on his face. (Describer) Later, Laurie holds him. Oh, Mr. Perfect. Do you see Daddy? Thomas. Where's Daddy? After that came first steps and first birthdays, all the usual family stuff. Thomas. I have to get closer. Thomas. (Describer) Just able to walk, he heads down a hallway. there's not a thing wrong with Thomas. But I continued to have suspicions. And he went and was examined. And the lady came out of the booth and said, honey, he wouldn't hear a train go by. And that was just so devastating for me. I thought I was just stabbed with a knife. But I held it together until I got in the car. (Describer) He wears hearing aids. always like that? I don't know. Drop it when you hear it. Listen again. Listen. As Thomas grew older, his audiologist helped us to understand the connection between hearing and speech. There it is. And slowly, we began to realize how hard we would have to struggle to communicate with our own child. Children learn their language by overhearing it. They don't make a conscious effort. They overhear. They listen. They just absorb like auditory sponges. A deaf child is cut off from that. But let me show you what children hear like who have some small amounts of residual hearing. (Describer) He plays a tape for the parents. I'll approximate it for you. [TAPE PLAYING MUFFLED SPEECH] So you hear the voice and it's muffled and it's unclear. Well, children speak the way they hear. So first of all, it's hard to even recognize that there's a language going on. So they won't pick up language code. And if they do pick up some, and they have to have something to say, when they have something to say it will sound muffled. So if you'll excuse me for imitating deaf speech, when it comes out, it might sound something like this. This is the speech of somebody who hears very well in the low pitches, but not in the high speeches. So they speak like they hear and they speak very characteristic. Say baseball. Baseball. Baseball. Good. We didn't care what Thomas sounded like, we just wanted him to talk. Say cowboy. Ha-po. Say, cowboy. Cowboy. Yeah, airplane. Airplane. We didn't know then how complicated things would get. Say the word dinosaur. Dinosaur. Say turtle. Say cowboy. Each word Thomas spoke gave us hope, but the pain was never far away. The first time someone said-- made fun of my brother being deaf was-- it really hurt me a lot. And then people found out that it did hurt me. So, other people started trying it and then denied it. What kind of stuff did they say? Like, at least I don't have a deaf brother and like, when we're playing a game, and someone yells, come on, Matthew. (Describer) Thomas sits on his mom’s lap. (Describer) She sets him down. like-- Mom, put Thomas on the ground. OK, Tommy come sit on the ground. (Describer) Matthew stands as Thomas moves his fingers together. He's gonna do something bad. I just know it's going to be something bad. Is that Itsy, Bitsy Spider? Are you doing the spider? because he doesn't have a whole lot of words. What me to do this? How did you feel when you found out Thomas is deaf? I felt very sad. (Describer) At home, Laurie reads to Thomas. I cried for about three days. It was very hard. Little pig, little pig. Let me come in, said the wolf. And the second little pig said, no, no, no! No, no, no! Not by the hair of my chinny, chin, chin. Then I'll huff and I'll puff and I'll blow your house in! And he [DEEP BREATHING] huffed... and he [DEEP BREATHING] puffed... then he [DEEP BREATHING] blew the house down! (Describer) Outside, Thomas spins on a swing. (Describer) He sits in the tub, then drops underwater, and sits back up. (Describer) Wearing pajamas, he picks up a sheet of paper and starts running through the house. The camera follows him down a hall and up stairs. (Describer) He joins Laurie sitting on the stairs. Little pig, little pig-- let me come in. Little pig, little pig, let me come in. (Describer) At a school, a teacher speaks and signs. What would you like me to do? Thomas, use your words. And what happens to spider's shoe? It broke. It broke? When it was time for Thomas to go to preschool, we had a choice. (Describer) With Thomas, a boy talks to another teacher. 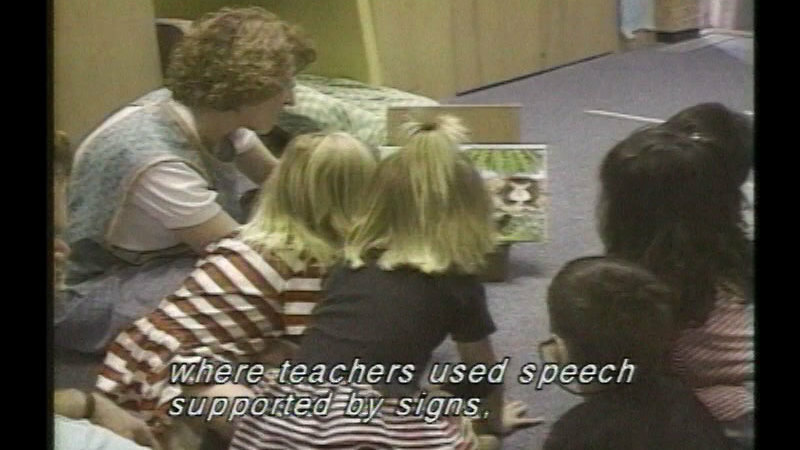 We could put Thomas in a class where teachers use speech supported by signs, or we could choose a speech only classroom. We chose the speech only class. (Describer) Three adults show a puzzle to a boy. or whatever comes more easily to them-- of course, the kid's going to choose the easier route. Out. Yeah, Thomas say it. Take it out. Kenny Orihuela is one of Thomas' classmates. Kenny used to sign, but his parents decided to have him fitted with a cochlear implant-- a surgically implanted device that imitates the way the inner ear works. Boy, he really hears with that, doesn't he? With the implant in place, the family has now switched to a method that requires Kenny to develop his listening skills. He can be deaf. If he wants to sign when he gets older, that's fine with me. I can live with that. I just wanted to give him choices. And the other way, I don't think he would have had the choice. I think to me, it's really rewarding to see Kenny. Sometimes we are playing and a truck goes by and blows a horn and Kenny will turn his head to me and smile and go like this-- like he hears something. That he heard that thing, whatever it is. And to me, that's very rewarding, before Kenny couldn't hear anything. (Describer) Thomas and two women are viewed through a window. but the long term effects are an adult that can speak. Is this hand mine? Since Thomas had some hearing in the higher frequencies, we were told that a cochlear implant wouldn't be appropriate for him. Still, Laurie and I wanted him to talk and that meant hours of speech therapy. Thomas, listen. Up, up, up, up. Daddy, Daddy. Yes, Tommy. Daddy, bup, bup, no. Oh, you heard it, Thomas! You were listening. You heard it. Daddy, Daddy, bup, bup, no don't want it. Does the bell say woof, woof? No. No, it doesn't? What does the bell say? (Describer) At home, he talks on a phone. but he couldn't really communicate. Often, what he said was just gibberish. (Describer) He turns the receiver upside-down. We had read that children's language development blossoms between the ages of 3 and 6. Thomas was 4 and we felt that time was running out. OK, Thomas, please do not hit. Do not-- wait a second, OK? Because-- Laurie was especially frustrated. It's hard to say this now, but I had let her take most of the responsibility for dealing with Thomas's deafness. She was stronger and it made it easier for me. (Describer) Thomas gives her one. (Describer) She and Thomas hug. Later, people sign in a large conference room. a documentary about Thomas, Laurie knew it was a way for me to get more involved. (Describer) A signing woman is interpreted. not only the hands, but the body and the face grammatically. We deaf people have a culture, right? Hearing people-- they look at us and they're not satisfied with the deaf, because we don't talk. history, heroes, all that goes with having a culture. And what we found through our research and through our experience with the deaf community is that living in a world as a visual person is very different from living in the world as a hearing person. Of course, underlying it all is the same humanity that we all share. But how we process the world, how we process language, what we need as hearing persons and as deaf persons is very, very different in order to achieve our potential, which is of course the same for everyone as a human being. Gallaudet University has been called the "cultural capital of the deaf world." Deaf is normal here and hearing people are the ones who need interpreters. I wanted to learn more about deafness and about the issues affecting our family. 93% of all deaf children have two hearing parents. That means that the parents, themselves, when they discover that they have a deaf child have probably never encountered deaf people before. So, not only is it a shock-- and they go through a grieving process because their child isn't what they expected, a normal hearing child-- but they also don't really know what deafness means. (Describer) In a classroom, a teacher signs and uses a hand puppet with a book. They don't know what it means to be a deaf person. Ate this one, ate this one, and ate that one. Ate them all up. He was full? (Describer) In the classroom, the kids sign. (Describer) Teachers and kids sign at a table. children as possible. That's been the underlying goal. Where's the juice? Charlene wants more. Where is it? In the classroom at Kendall, speech was used very little, but there was plenty of communication. (Describer) Principal Nancy Shook, who signs and is interpreted. And watching these children made me feel even more frustrated about Thomas. He's saying what? Mommy, daddy, milk. He says juice, sit down right now, I don't want it. But that's all, he can't say this is a lovely day. Or thank you for being nice to me. Well, that's because he's been taught all the speech sounds as possible, but he hasn't been taught the concept, the vocabulary, with which to work. I think you've seen a class that we have here at Kendall. You see the kids just bursting with language. (Describer) A man signs on stage and is interpreted. (Describer) An audience of kids replies in sign. They have the concept. Do you want any more? For sure? Really? Do you want another story? Fine. OK, the title is "The Eagle and the Squirrel", OK? (Describer) The storyteller acts as the eagle perched, then flying with arms out and with them crossed. The eagle soars. At storytelling time, I saw how deaf children respond to visual communication. (Describer) A girl in the audience smiles, and other kids watch intently. (Describer) As the eagle flies, he spots something below. The storyteller becomes the squirrel with a small mouth and little front paws feeding himself nuts. (Describer) As the eagle, he smiles and mimes flying lower. (Describer) As the squirrel, he looks around, puts a hand to his ear, and starts running, shown with his hands. He switches back and forth between eagle and squirrel to evoke a chase. (Describer) The eagle reaches out with claws, which grab onto the squirrel’s shoulders. The squirrel begins to lift into the air as the eagle rises. (Describer) The kids keep watching. (Describer) As the squirrel, he takes a nut from his mouth and offers it upward. (Describer) Looking down, the eagle points at himself, saying “me?” He takes the nut and eats it, releasing the squirrel, who brushes off his shoulder and runs away. The eagle looks down and snaps his fingers with disappointment. The storyteller crosses his hands as he waves them to indicate wings, then switches to waving fingers to evoke the eagle flying into the distance. (Describer) He waves goodbye, then holds his arms out to the audience, who applaud by holding their hands up and shaking them. The storyteller, Bernard Bragg, signs and is interpreted. (Describer) But at the same time, ASL is his language. And I would encourage that. I would want him to have both. And if I were a hearing parent, I would try very hard to learn as much as I could so that he would understand that I’m not looking down at his deafness. I feel good about him as a person. His deafness doesn’t bother me. that farther he will go. But at the same time, ASL is his language. I would encourage that. I would want him to have both. If I were a hearing parent I would try very hard to learn as much as I could so that he would understand that I'm not looking down at his deafness. I feel good about him as a person. His deafness doesn't bother me. I learned that the sign language I saw being used on the Gallaudet campus had once flourished in American schools for the deaf. But around 100 years ago, advocates of speech training fought a successful battle against sign language in the classroom. 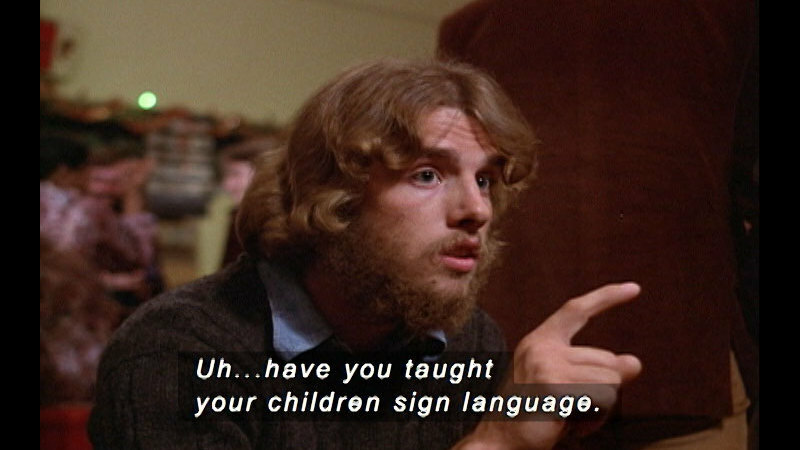 Until the early 1970s, sign language was forbidden in many schools. (Describer) Gannon: Lots of those angry adults feel they’ve been cheated. They’ve been cheated out of a good education. They’ve been cheated out of a good relationship with their own families. They feel they’ve been cheated out of so many things because they were restricted only to one method: oralism. And there are deaf adults who remember those days with anger and resentment. Lots of those angry adults feel they were being cheated out of a good education. Being cheated out of a good relationship with our own families. (Describer) Now they’re angry about that. And to be honest with you, I think they have a right to be angry. They're being cheated out of so many things because they were restricted only to one method, oralism. Now they're angry about that. And to be honest with you, I think they have a right to be angry. I can remember when I was 13 years old, I had a teacher-- a hearing teacher-- who was so high strung, very anxious, she couldn't tolerate any type of noise that the deaf children made. And worst of all, she couldn't tolerate the sounds we made when we laughed. And she said, "you sound like animals in a zoo!" And she picked on one boy, by the name of Sam, and says, oh, "Your laughter sounds like chalk on a blackboard." So she made us stand and put our hands on our stomachs to let the air out and inhale and exhale. She made us do this. We all practiced inhaling and exhaling with our hands on our stomach. Then she said, "Now we will add the voice. "Add the voice like this, from the stomach-- "not from the head, "but from the chest. Let it all come out, OK?" And then she kept picking up Sam, popping him on the head and saying, "You're not doing it right." And so we practice and practice. And finally, we practice with our hands on our chest, then we added the voice, and, as you hear, that's how we laugh. Ha, ha, ha, ha. And she said, "Oh, you sound so nice. "So pleasant. So pleasant-- that hearing people would never guess that you were deaf." Intolerance is the subject of Clayton Valli's American Sign Language poem "Dandelion". (Describer) Among other signs, Valli grimaces and indicates pulling things from the ground, then pushing material over that ground. Because it is a visual work, Valli told me the poem can't be translated. (Describer) The ground is covered more smoothly, and he indicates movement in the sky. (Describer) Holding fingers over fingers horizontally, he pokes one finger up, then tents the fingers and opens them into a flower, that waves. (Describer) Small pieces of it fly off. He repeatedly does the blooming motion. He holds his hands further apart to indicate more movement, and puts his left index finger on the back of his right hand. He repeats those two actions a couple times. (Describer) He grimaces again and does the two actions again. (Describer) He makes a fist and hits the back of his left hand, pulls back, then wiggles all his fingers to indicate many small things falling at once, spreading over the ground. Your son is profoundly deaf. There's no way on earth that he could hear. Understand-- develop language based on what he hears. He needs everything visual. He needs you to introduce life, introduce love, introduce happiness through signs. Because that's what he sees. He needs that. I was moved by the pride and independence of the deaf community and I was grateful for the way they had reached out to us. But our family wasn't deaf, we didn't sign. (Describer) In another classroom, teachers and kids sign at tables. And when I left Gallaudet, the distance between us and Thomas seemed even greater. Back in Dallas, I spent some time with the speech and sign class at Thomas' school. One day, I saw a little boy named Christopher kidding around with his teacher about purple potatoes. (Describer) He and a man sign to each other. I was impressed because Thomas hardly ever made word jokes like that. Purple potatoes? I wondered what Christopher's parents would say about their choice for him. There's going to be instances when he's going to be around people that use sign language, there's going to be instances that he's going to need the communication with the oral, so we thought, at the time, I said, that would be the best way. So whatever situation he was put in, he would be able to handle it. We go to sign language class on Tuesday evenings and after working, sometimes, I really don't want to go. That's the last place I want to be. But I make myself go for Christopher. (Describer) The mother looks up and away. Because I know that I have to be able to talk to him. And I keep thinking in the back of my mind, I'm really not going to need know these signs, because one day he's going to wake up and he's going to have his hearing and he's just going to start talking. He's going to have all these words saved up from four years and he's going to just rattle off a whole bunch of sentences. (Describer) Thomas’ father tries signing. I really know that's not true. But, I guess, I hope for that. (Describer) Laurie tries signing with a man. (Describer) She draws circles with her index fingers and holds her hands out with palms up. to see what it was like. It wasn't easy. (Describer) At home, Laurie holds Thomas as he cries. We finished the course, but didn't register for the second session. (Describer) He shoves at her chest. At home, Thomas was losing his temper a lot. No hitting. (Describer) Thomas lies in bed. We both wanted desperately to communicate with him. I love you. I love you. (Describer) She tries to sign. Thomas does too and kisses his fingers. I thought we should work harder on sign language. Laurie wanted to stick with speech. We have a child who is different from us. And we've got to totally reevaluate our relationship to him and consider other relationships to the world that don't include hearing. You know what I'm thinking of? I'm thinking of-- OK, it's like having a child not born with legs, but with fins. And all of a sudden you're going, "Oh my gosh, "we've got to go live in water. This child doesn't belong here on land." this child needs to go someplace--" Is that what you're saying? I mean, because to me that's as dramatic a change-- what we have to do is go find him a deaf home? Put him in a deaf community? We don't live in a deaf community, Robbie. We live in a hearing one. That's our family. We are Tommy's family. He came to us. Yeah, but we can come to him. Well, I'm not saying we can't, but I think that we need to determine when. (Describer) Thomas passes Christmas lights to Laurie, who stands on a chair by a tree. He needs to be in a position to be able to say, "This is what I want." (Describer) She starts putting them on. (Describer) He bends down to under the tree. Uh, Mommy, Mommy. Mommy! Mommy! (Describer) He mimes picking things up. Dinosaur... Truck... Crane. That's what Tommy wants for Christmas? Tommy wants a dinosaur? Right, a dinosaur? Yes? Dinosaur. A dinosaur. And what else do you want-- a truck? Truck. And one more thing-- a crane? Yes. Well, you tell daddy. Thomas, you tell daddy what you want. You say I want. I want-- a truck. truck. a dinosaur. Mommy, Mommy, this Mommy. You have to be realistic. I don't want him to live in a world where he's going to need an interpreter all the time. I want to be able to give him that freedom to be able to travel and do what he wants to do, whenever he wants to do it, without that restriction. If he lives the first seven years of his life unable to express himself, what kind of freedom is that? What are you giving him? That's, maybe, in Thomas's case, the price of his freedom. I'm not happy with that Robbie. Tommy, Tommy, it's OK. No, [SPEAKING INDISTINCTLY]. Daddy... Mommy... Sweetie pie, I don't know what you're saying. (Describer) Not looking at the boy, Thomas walks off. Two other kids talk. Hey, want to watch? He's going to eat that little dinosaur. He ate it. (Describer) The girl swings by her feet. And how old you? Four. I'm four, too. See, you're not older than me. I'm four and a half. (Describer) The boy yells at Thomas holding a toy gun. I'm four and a half, too. It's not yours! Give him it! It was hard not to compare Thomas to other children his age. The world seems so full of language. Did Thomas know how old he was? Or what a year is? Or what tomorrow means? (Describer) People gather outside a school. We knew he was happy with us, but we didn't want him to grow up alone. I wanted to do more research. And so I visited the Central institute for the Deaf in St. Louis, one of the oldest oral schools for the deaf in the country. The colors were hot. Children at CID are instructed entirely in spoken and written English. Sign language is not used. I like peanut butter and bananas. I like peanut butter and bananas. On my sandwich. On my hamburg! On your what? Listen, on your hamburger. On my hamburger. Oh I think you are very silly. in a system that focuses just on talking. I am glad that I had the opportunity to come to CID and to learn how to talk. Now I can communicate with anyone. I met Scott Campbell on the day he was practicing his graduation speech. ...cut the crass. I wanted him to learn how to talk. I wanted him to be able to communicate with the hearing world. I wanted him to be able to go into McDonald's when he was six, seven years old and order his own food. And he's been doing that. And have people understand him and for him to understand them. (Describer) He folds up his speech and goes to Moog. Thank you Mom and Dad. OK, that was good. (Describer) They look over the speech. (Describer) Robbie talks with Scott. (Describer) Subtitles: Well, does he have hearing aids? Oh, he does. Does it help? but he doesn't know-- "I'm a deaf kid and these kids are hearing and I'm deaf." When did you first know that you were deaf? Does he have hearing aids? Yeah. Oh, he does. Does it help? Yeah it does help him. Yeah. And sometimes he asks for them. (Describer) Well, sometimes…well at the beginning when I was a little boy. I wasn't too sure what I'm doing. I'm deaf, and I do not understand. (Describer) …and I do not understand what I'm doing. I thought, "I'm with hearing… hearing group or deaf group. I was so confused. And sometimes that makes me mad that I could not communicate with the hearing friends. (Describer) Because the hearing friends had more fun that deaf, because deaf cannot communicate. with a hearing friend. Because the hearing friend had more fun than deaf, because deaf cannot communicate. I think that being born deaf does not-- in and of itself-- make you a member of a different culture unless you so choose to be a member of that culture. I understand that there is another language, American Sign Language, and that if you choose to learn American Sign Language, and to only communicate in American Sign Language, you are part of that deaf culture. However, if you choose to learn spoken English, then you can be part of the American culture. (Describer) Kids arrive at a smaller school. (Describer) Phillip and a woman sign with a toddler. 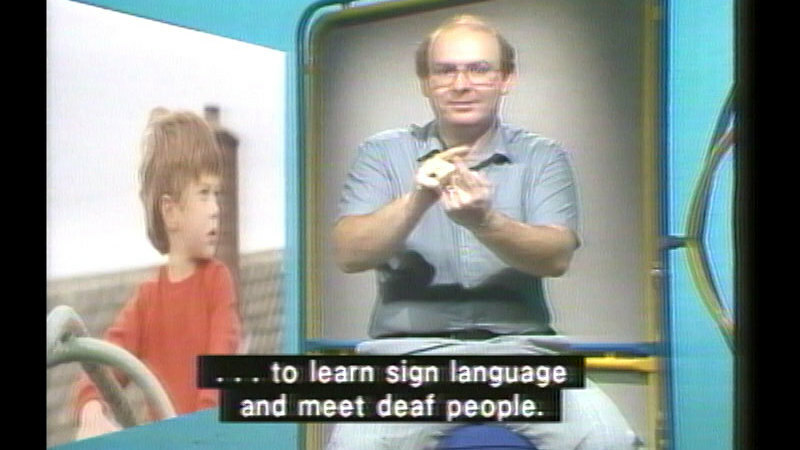 that the deaf adults at the school were role models who sent their children an important message. You're going to grow up and you're going to be deaf and you might be like me, or you might be like this person, but you can go to college. You can get married. You can have kids. (Describer) A little girl signs in a classroom. (Describer) He’s interpreted into ASL. (Describer) A parent signs and is interpreted. (Describer) Holding her, she shrugs. and I wouldn't want her-- I always want her, but I wouldn't want her any other way. She wouldn't be Courtney. (Describer) Three people work in a dance studio. a lip reading method that uses hand shapes to help identify different sounds. It's a system that was invented about 25 years ago. It's used throughout the United States and throughout the world, but it has not gained significant recognition, in part because of the war between the oralist and the manualists and the fact that it falls somewhat in between. (Describer) Subtitles: A lot of people don’t know much about cued speech yet, and the only way for me to really have a relationship with other deaf people like me is to learn sign language. (Describer) And it’s also easier to communicate using sign language because...because when you speak, you have to sort of make an effort to speak, and with sign language you can just talk. (Describer) Alina, subtitles: Sometimes, like in school, sometimes the kids were teasing me a few years ago over my deafness, you know. It was a real pain. (Describer) Well, just say, "Live with it. That's life." (Describer) Laurie watches a teacher work with Thomas. that's life." Here comes the car and the fire truck. Uh oh! When I returned home from Brooklyn, it was time to evaluate Thomas's progress in school. What is this? Ambulance. Ambulance. That's right. Laurie and I had to decide whether we wanted to keep him in the oral class or expose him to sign language. Woo-woo! Did you bite Matthew? Let me see your arm. Did you bite Matthew? It fall down. We were under a lot of pressure about Thomas and sometimes it made life around the house pretty tense. --bite, Thomas! You-- I'm the one that's caring for him and you've gone off and you've intellectualized about what's best for Thomas, when in fact, I think that's a decision that needs to be jointly made based on research, emotion, and practicality. And I don't think that you are giving the practical aspect of hearing parents raising a deaf child enough weight. Because there is a practical side. Integrating a deaf child into a hearing family. (Describer) He wears a Batman logo. (Describer) The parents meet with a woman. Mommy, mommy. Hi, Batman! Time for school? Why don't we make this one of our goals, too, for next year is answering what and where questions. And who and why. Thomas's speech and language had improved, but not enough for either of us. And the evaluations at school were depressing. Does he know his last name? Yes. So, if you say, what's your name, he'll say, Thomas Tragen? No, he'll say Thomas. He really can't say his name. I mean, if you said, what's your name, little boy? He wouldn't say it. Yeah, he'd be helpless. I'm going to give him an emerging on this because he does have some kind of an awareness that he has a first and last name. (Describer) She works with Thomas. Although he can't state it if you say, what is your name? What is your whole name? Look at that? Carla was always trying to give us hope and she believed in Thomas. Happy mouth. I'm not deaf. I'm not deaf, I hear. Too hard. You have to be more gentle. You have to be soft. Tommy, please don't think you only made us cry. You've made us so happy, just look at how much. We want you to be happy, but it's hard to know how. (Describer) A banner says, “Texas Deaf Caucus”. here celebrated the anniversary of the deaf president now strike at Gallaudet. We have a dream. We have a hope. We have desires. (Describer) Laurie and Thomas look at a book. and opening doors and careers to him. And these are very sharp. (Describer) A bucket on a ladder, then a tv. Scissors. And what do we have here? Watch it. Watch a tape. Bath. We're still working on Thomas's speech. Shower. OK, Thomas. Let's play a game. Your turn. And recently, the daughter of a person we know at Thomas' school has been teaching us sign language. (Describer) She does the sign for “lion”. Her name is Rebecca and she's deaf. Lions. (Describer) He covers Laurie’s mouth, then does the sign. Oh, Thomas, lion. Are you going to show us a lion? Don't. Rrrr! Good job. That's very good. That's a lion. (Describer) He puts thumbs on his temples and moves his fingers. Horse. Can you do horse? No, no. What's the sign for horse? Yes, that's great. 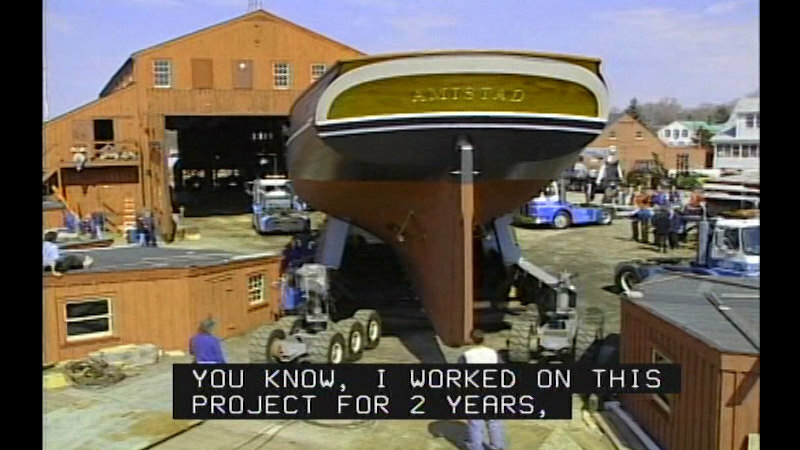 The way you're ending this documentary bothers me. I'm not really happy with it, because you end with Rebecca. That means you're ending with sign, as if after all this searching we finally decided that signing's wonderful. Well I'm not adverse to that, but I haven't completely satisfied my need to answer all those questions that still lay out there. (Describer) At a restaurant, Thomas stands. And ultimately, the questions will be answered by Thomas. It's up to Thomas. Oh, you want to kiss me? Well, just a minute. I like your new glasses. It's true, the story doesn't end here. We haven't made a decision yet on what we're doing at school next year with Thomas. We know that whatever we do it won't be easy, but for now, we're just going to enjoy each other. Well, we made up a sign in the car and it was all Tommy's doing. He wasn't just a little happy, he was big happy. Can you show? Big happy. That's right. Big happy! Big happy! Big happy! We made a lot of mistakes, Thomas. And I'm sure we'll make some more. When you become a parent, I know you'll understand. We wanted to change you, but you changed us. You'll see this someday and wonder why we made such a big deal about it. Think of it as a gift, the way we think of you. (Describer) Titles: Produced and directed by Rob Tranchin. Written by Rob Tranchin, with Laurie Tranchin, Ginny Martin. Edited by Ginny Martin. Photography: Bert Guthrie. Original Music: Stan LePard. Interpreters: Stella Ashley, Robert Hahn, Thomas Wright, Deborah Tomardy, Johnmark Ennis, Susan P. Russell, Phyllis Rogers, Linn Stanton, Lena Dumont, Grady Altom, Tammi Malret. Online Technical Director: Marshall Sansbury. Online Editor: Joe Bill Worthington. Online Audio: Earl McDonald. Narration Recording: Susan Schewe. Executive Producer: Yolette Garcia. Executive-in-Charge: Sylvia Komatsu. KERA - Copyright 1994 North Texas Public Broadcasting Inc. Accessibility provided by the US Department of Education. Little pig, little pig, let me come in. Little pig, little pig, let me come in. (Describer) A logo features a line of three faces in profile. For a Deaf Son is made possible in part by Acordia, a network of companies providing insurance brokerage, administration, and selected financial services across America. American Airlines-- providing daily flights to Europe and offering the American Airlines advantage travel awards program since 1981. The Southwestern Bell Foundation. Funding also is provided by the Corporation for Public Broadcasting, and the Southern Educational Communications Association. When Thomas Tranchin was one year old, his parents discovered he was profoundly deaf. His father, a filmmaker, produced this program (in video diary format), which originally aired on PBS. The program tells of a family's journey through a maze of emotional, educational, political and social factors as they face life-changing decisions. Includes interviews with family members, audiologists, and others. The "speech versus sign language" conflict is documented in detail. Oral, manual, and cued speech approaches are outlined and supplemented with viewpoints from a variety of sources as Tommy's parents struggle to find the best way for their child in this rare glimpse into the difficult choices faced by hearing parents of deaf children. Awesome. Helps students get a better understanding of hearing parents trying to decide the best method of communication with a deaf child. This excellent documentary always leads to very animated, passionate discussions. My students researched what happen to the boy after the movie. They were motivated to learn more! Great and one of my favorite video. I enjoyed the documentary. I thought though that the Mother was unrealistic with her expectations and was too concerned about who should have or could have been her son. Good example of what Parents think and feel about having a child who is deaf.